Jimmy Jumps House/Hostel i Vilnius, Litauen : Boka nu! Översatt av Med "en gratis svammel frukost att dö för" och "en känsla-at-home atmosfär", Jimmy Jumps Hostel kommer att svika. Vandrarhemmet erbjuder en imponerande inventering av utflykter och aktiviteter (som du kan prova allt från "kulsprute turer" till "skogs bastur") och med en bekväm allrum och terrass, det finns gott om möjligheter att träffa nya människor. Du kan nå Jimmy Hoppar lätt från den centrala busstationen, och dess centrala läge gör det enkelt att utforska Gamla stadens största webbplatser. Kolla in det stora torget och rådhuset, bara 5 minuters promenad från vandrarhemmet dörren. Great place to stay. Very centrally located just 15 minutes walk from the bus station. The staff was very helpful and chatty. Free waffle breakfast was great. The only slightly bad thing was that the dorm I was in didn't have electrical outlets by the beds, and the wifi (in the dorm) was not really working. Would definitely stay again. The location is perfect and the staff were so kind! 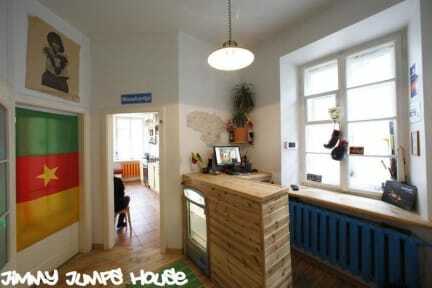 I really liked the Jimmy Jump Hostel. Staff was really helpful. The room was spartan, but did contain everything i needed except a mirror. Kitchen area was nice, cosy and a good place to socialize. We got a quick lesson in possible things to do and possible places to go to when we did check in. All of them that we did try was awesome. Remember to bring earplugs though due to the small but oh so intensivly trafficed street its located at. Good atmosphere, welcoming people. Some reviewers pointed out that some rooms were a bit unclean but didn't notice that. Gabriella at the front desk was super friendly and pleasant to talk to! Great location and great staff. 15 min walk to train station and old town city center just around the corner. Good value for money. Jimmy Jumps Hostel is located pretty good in the city centre. Very friendly and helpful staff. The 10-bed dorm room was ok. But they really need to attach the lockers for bags/belonging to the wall, since it almost fell over me. There are no bedlamps. The breakfast is waffles and jam. I would have liked some bread or yoghurts. Overall still well worth the money and I can recommend them. Had a great stay at Jimmy Jumps. 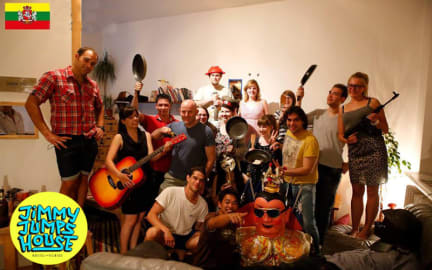 The hostel offers a wide range of amenities and is perfectly located. The vibe there is perfect for a solo traveler and so I recommend the hostel for anyone visiting Vilnius!